The hostess of the 4th of July pool party I'm attending today made a special request for some Kugel. For the uninitiated, that's a sweet or savory noodle pudding made by delis and Jewish grandmothers everywhere. When I used to work at Miller's Deli, we made awesome Kugel. So creamy and sweet that you could eat it as a meal in itself. One of the keys to a good Kugel is a nicely browned and crispy top to go with the pudding-like middle. Bake all together in 400 oven. Thanks gramma, but for us n00bs how about a little more to go on? I ended up doubling the whole thing and hoping for the best. I cooked the noodles in boiling water for about 8 minutes and drained them. Then I whisked all the other ingredients together in a medium mixing bowl. I then put the noodles in a rectangular glass pyrex baking dish and poured the wet ingredients over it. It's cooking right now. 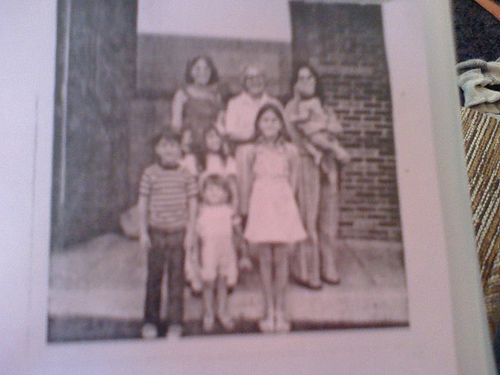 Oh, and the accompanying photo was of my whole family, including me in the top right as a young whippersnapper in my mom's arms. yum! and love the photo.